Our Continuous Development Programme has proven to improve reliability and accuracy for our machines to create better process capability and help reduce ever spiralling production costs. AMT are continually making Improvements by Design to all of our machines in order to exceed our customers’ expectations and help contribute towards their success. 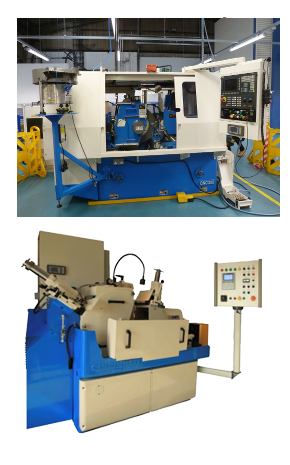 Centreless Grinding is a typical example of this philosophy because it has always played an important role within the aircraft fastener industry and the Cincinnati 2 OM model is probably the most commonly used machine for this process. The downside is however, that very little has changed regarding its basic structure or design since its launch in the1950’s and repeated refurbishment programmes are inevitable and necessary to achieve better working tolerance conditions for this machine. This leads on to another more worrying problem whereby locating suitable Cincinnati 2 OM donor machines for refurbishment is proving more difficult, as depleting stocks worldwide may eventually lead to a total phase out for this machine type. Therefore, to ensure Future Proofing against this current trend, thus allowing more peace of mind for our customers, AMT has introduced a new cost effective centreless grinding machine, in conjunction with an experienced associated partner with proven capabilities and readily available new equipment which is completely non-dependent in having to source old parts for outdated machines.